The Southern Cross is one of the best known asterisms in the night sky, and the most familiar star pattern in the southern hemisphere. Composed of five stars forming the shape of a cross, it is the most distinctive feature of the constellation Crux, the smallest constellation in the sky. The Southern Cross is notable for containing two bright stars, Acrux and Gacrux, which point the way to the Southern Celestial Pole. The asterism is one of the easiest to identify in the sky and it has significance in a number of cultures in the southern latitudes. The five stars that form it are represented on the flags of Australia, New Zealand, Papua New Guinea, Samoa, and Brazil. The Southern Cross is also included in the national anthems of Australia and Brazil. 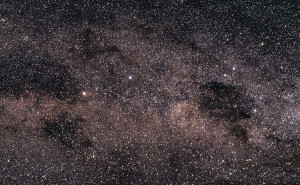 As the Southern Cross dominates Crux constellation, it is often confused for the constellation itself, which contains more than five stars. The stars that form the cross asterism are just the brightest ones located in the constellation. The cross-shaped pattern can easily be seen from the southern latitudes at any time of year. Observers in the tropical latitudes of the northern hemisphere can see it near the horizon in winter and spring, but only for a few hours every night. 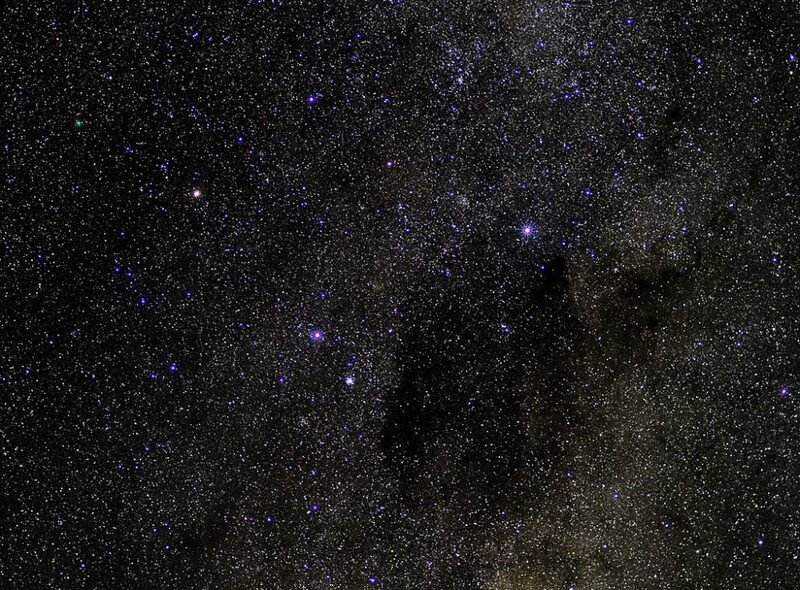 The stars of the Southern Cross – Alpha, Beta, Gamma, Delta, and Epsilon Crucis – form an asterism that really looks more like a kite than a cross. Two of the brightest stars that form the cross, Alpha Crucis and Beta Crucis, are among the brightest stars in the sky and easily visible from the southern hemisphere. 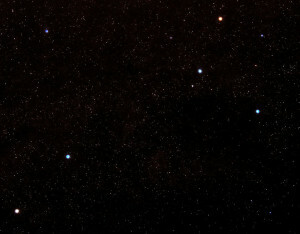 The stars Alpha, Beta and Delta Crucis are co-moving members of the Scorpius-Centaurus Association, a young association of stars in the constellations Scorpius and Centaurus that belong to the spectral class O and B, have common proper motion, and are believed to have formed inside the same giant molecular cloud. 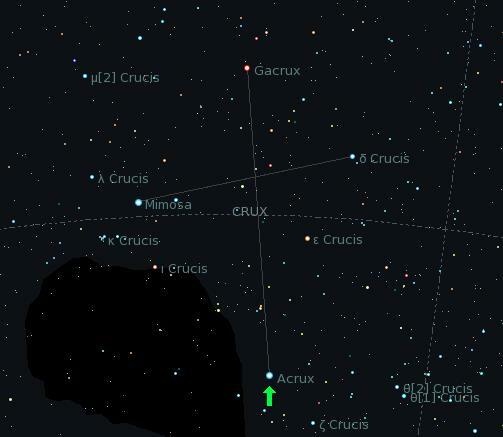 α Crucis (Alpha Crucis), also known as Acrux or HD 108248, is a bluish star that marks the bottom of the Southern Cross when you are facing south. It is the brightest star in the constellation Crux. It is really a multiple star system with a combined apparent magnitude of 0.77, making Acrux the 13th brightest star in the night sky. Alpha Crucis is the southernmost first magnitude star, lying just a bit more to the south than the bright Alpha Centauri in Centaurus constellation. Acrux lies at a distance of 321 light years from Earth. It has an absolute magnitude of -4.14. The Alpha Crucis system has only two components that are visually distinguishable. The two stars are separated by four seconds of arc. Alpha-1 Crucis has a visual magnitude of 1.40 and Alpha-2 Crucis has a magnitude of 2.09. Both components are hot class B stars on the verge of becoming class O. They belong to the spectral classes B0.5IV and B1V. Their surface temperatures are 28,000 and 26,000 K, and luminosities 25,000 and 16,000 times solar respectively. The name Acrux is an abbreviation for the Bayer designation Alpha Crucis, which entered common use by the mid-20th century. It was coined by the American cartographer Elijah Hinsdale Burritt around 1835. Acrux is located at -63° declination and can only be seen south of latitude 27°N. In Portuguese, the star is known as the Star of Magellan, or Estrela de Magalhães. β Crucis (Beta Crucis), or Becrux, is also known by a proper name, Mimosa. The name, derived from the Latin word for “actor,” likely came from the flower. It is the second brightest star of the Southern Cross asterism. It is at approximately -60° declination and can’t be seen north of 30°N. The star is about 280 light years distant from the solar system. Beta Crucis has an apparent magnitude of 1.25, almost the same as Deneb, the brightest star in Cygnus constellation and one of the stars that form the Northern Cross, a prominent asterism in the night sky in northern latitudes in the summer months. Mimosa is the 19th brightest star in the sky and Deneb, the 20th. Mimosa is thought to be the hottest first magnitude star. The star is classified as a Beta Cephei variable with three different pulsation periods. It is really a spectroscopic binary system, consisting of two components that can’t be resolved with a telescope because they are too close together. The stars orbit each other every five years. The Coalsack Nebula is located approximately 600 light-years away from Earth in the southern part of the constellation of Crux (the Southern Cross). This seemingly starless dark patch is actually an opaque interstellar dust cloud that obscures the light of the background Milky Way stars. The first European to see this remarkable object was probably the Spanish navigator and explorer Vincente Yanez Pinzon when he sailed to the South American coast in 1499. The Coalsack earned the nickname “Black Magellanic Cloud” in the 16th century, apparently rivalling the prominence of the Small and Large Magellanic Clouds, the two dwarf irregular galaxies that shine brightly in the skies of the Southern Hemisphere. The Incas tell that the god Ataguchu, in a fit of temper, kicked the Milky Way and a fragment flew off, forming the Small Magellanic Cloud where it landed on the sky, and leaving the black mark of the Coalsack behind. Beware of Inca gods in a bad mood! The system is a relatively young one, with an estimated age of 8 to 11 million years. The primary component belongs to the spectral class B0.5 III, which means that it is a blue-white giant star. The companion is believed to be a main sequence star belonging to the spectral class B2. A third star was discovered in 2007, which may be a pre-main sequence star, and there are two other stars nearby which are believed to be optical companions, lying in the same line of sight but not physically associated with the Beta Crucis system. δ Crucis (Delta Crucis), sometimes known as Pálida (“the pale one” in Portuguese) has a visual magnitude of 2.79 and lies at a distance of around 345 light years from Earth. It belongs to the spectral class B2 IV. It is a hot, massive blue-white subgiant star currently in the process of becoming a red giant. The star is a rapid rotator, with a projected rotational velocity of 210 km/s. It has a mass 8.9 times that of the Sun and is 10,000 more luminous. Like Mimosa, Delta Crucis is believed to be a Beta Cephei-type variable. γ Crucis (Gamma Crucis), also known as Gacrux or HD 108903, is a red giant with the stellar classification M3.5 III. It has an apparent magnitude of 1.63 and is approximately 88.6 light years distant. It is the nearest red giant star to the Sun. Gacrux is the third brightest star of the Southern Cross, after Alpha and Beta Crucis. Gamma Crucis is also sometimes called Rubidea, or Ruby-like, because of its colour. It is only about 30 percent more massive than the Sun, but has 84 times the Sun’s radius and is 1,500 times more luminous. The star is classified as a semi-regular variable (SRV) with multiple periods. ε Crucis (Epsilon Crucis) is a fourth magnitude star, with a visual magnitude of 3.56, belonging to the spectral class K3III, which makes it an orange giant. It lies at a distance of 228 light years from the solar system. Epsilon Crucis is also known as Intrometida, or “the intrusive one” in Portuguese. The star has 1.42 times the Sun’s mass and a radius 32.9 times solar. 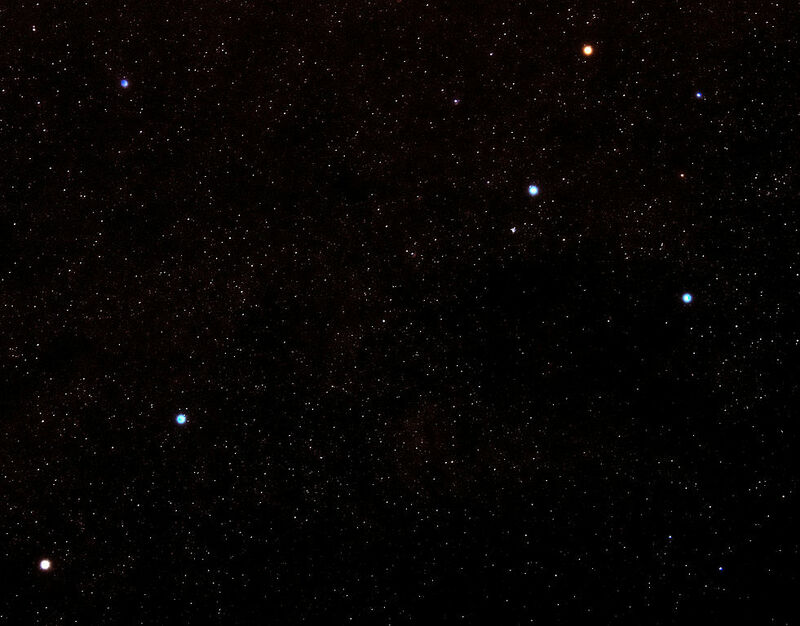 The Southern Cross is located near the larger constellation Centaurus, which surrounds it on three sides. Crux constellation is also bordered by Musca, the Fly. To find the Southern Cross, first look for the two very bright stars nearby, Alpha and Beta Centauri. Following a line from Alpha to Beta Centauri will take you near Gamma Crucis, the top star in the cross asterism. The Southern Cross spans only six degrees from north to south, a distance only slightly bigger than the one between Merak and Dubhe, the pointer stars located in the Big Dipper, which point the way to Polaris, the North Star, located in Ursa Minor constellation. To see the Southern Cross, one must be in the southern hemisphere, or at least as far south as 25°N, where the asterism is visible just above the southern horizon. In tropical latitudes, the stars can be seen from April to June. 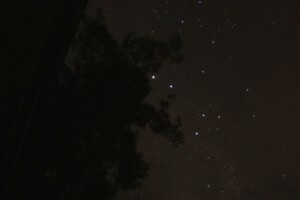 The constellation Crux lies exactly opposite to Cassiopeia and the two can never be visible in the sky at the same time. Observers south of 34°S can see Crux at any time of year, as the constellation is circumpolar for those latitudes: it never sets below the horizon. The Southern Cross should not be confused with the so-called False Cross, formed by four other bright stars in the vicinity. The X-shaped False Cross bears a slight resemblance to the Southern Cross and is oriented in approximately the same way, but the four stars – two belonging to the constellation Vela, the Sails, and two to Carina, the Keel – are located a bit farther to the north, and they do not point to the Southern Celestial Pole. They will, however, mark the pole’s location around the year 8600, when the pole has gradually shifted to a point just east to the intersection of the False Cross’ cross-arms. The Southern Cross was also found depicted on a stone engraving in Machu Picchu. The Incas knew it as “Chakana,” meaning “stair,” and it played an important part in Incan mysticism, symbolizing the three tiers of the world: the heavens, the world of the living, and the underworld. The Southern Cross was visible in the northern hemisphere about 5,000 years ago, including most of North America, as well as Babylonia and Greece. The first documented example of discovery of the Southern Cross was found in Ancient Greece around 1000 BC. Ancient Greeks considered Crux to be a part of Centaurus constellation. The cross could be seen from Athens at the time, but it was low in the sky. Once the precession of the equinoxes lowered the whole constellation below the horizon when observed from Europe, the five bright stars of Crux were gradually forgotten. Richard Hinckley Allen, a 19th century expert in stellar nomenclature, noted that the stars of the Southern Cross were last visible on the horizon in Jerusalem around the time that Christ was crucified. As a result of precession, the Southern Cross eventually sank below the horizon for most of the northern hemisphere. The Southern Cross was rediscovered by Europeans in the Age of Discovery, in the period from the early 15th century to the early 17th century. Portuguese sailors mapped Crux for navigation while sailing near the southern tip of Africa, and Amerigo Vespucci is believed to be the first European to see the “four stars” as he called them, during his third voyage in 1501. It was in this period – at some point in the 17th century – that Crux was finally separated from Centaurus. Sources disagree about who was responsible for the separation, citing either the Dutch astronomer Petrus Plancius, who split the constellations in 1613, or the French astronomer Augustin Royer, who separated them in 1679. Like Ursa Major, whose bright pointer stars show the way to the North Star, the Southern Cross can be used to find the location of the Southern Celestial Pole, and has been used by navigators for centuries. The longer bar of the cross-shaped star pattern points almost exactly to the South Pole in the sky. Aviators and sailors sometimes refer to this point as the “south polar pit” because there are no bright stars marking it. The Southern Celestial Pole can also be located by drawing a line between the stars Alpha and Beta Centauri in Centaurus constellation, and finding the point where this line intersects with the one from Alpha to Gamma Crucis. 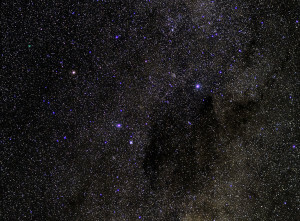 Alpha and Beta Centauri are sometimes called the Pointers, or the Southern Pointers, to differentiate them from the two stars in the Big Dipper.